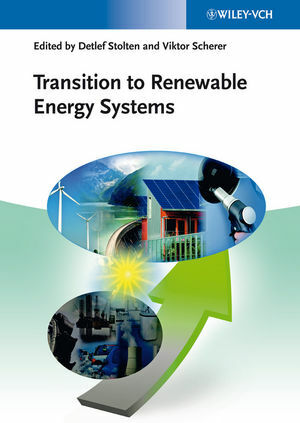 In this ready reference, top academic researchers, industry players and government officers join forces to develop commercial concepts for the transition from current nuclear or fossil fuel-based energy to renewable energy systems within a limited time span. They take into account the latest science and technology, including an analysis of the feasibility and impact on the environment, economy and society. In so doing, they discuss such complex topics as electrical and gas grids, fossil power plants and energy storage technologies. The contributions also include robust, conceivable and breakthrough technologies that will be viable and implementable by 2020. Detlef Stolten is the Director of the Institute of Energy Research at the Forschungszentrum Jülich. Prof. Stolten received his doctorate from the University of Technology at Clausthal,Germany. He served many years as a Research Scientist in the laboratories of Robert Bosch and Daimler Benz/Dornier. In 1998 he accepted the position of Director of the Institute of Materials and Process Technology at the Research Center Jülich. Two years later he became Professor for Fuel Cell Technology at the University of Technology (RWTH) at Aachen. Prof. Stolten's research focuses on fuel cells, implementing results from research in innovative products, procedures and processes in collaboration with industry, contributing towards bridging the gap between science and technology. His research activities are focused on energy process engineering of SOFC and PEFC systems, i.e. electrochemistry, stack technology, process and systems engineering as well as systems analysis. Prof. Stolten represents Germany in the Executive Committee of the IEA Annex Advanced Fuel Cells and is on the advisory board of the journal Fuel Cells. Viktor Scherer is the Head of the Department of Energy Plant Technology at the University of Bochum, Germany. He received his doctorate from the Karlsruhe Institute of Technolgy (KIT), Germany. Prof. Scherer worked for more than 10 years in the power plant industry for ABB and Alstom. In 2000 he was appointed as a Professor in Energy Plant Technology at the University of Bochum. His research activities are focused on the analysis and description of chemically reacting flow fields in the energy related industry, like power plant, steel and cement industry. Another research aspect is the integration of membranes for carbon capture into Integrated Gasification Combined Cycle (IGCC) power plants. Prof. Scherer is a member of the scientific advisory board of the VGB Power Tech, the European association of power and heat generation. Flexible Power Generation from Biomass - an Opportunity for a Renewable Sources-Based Energy System?